The Pro-120 series are card controllers, open to the elements – and users. They are similar to the VTX and older NCC series – but have several more sophisticated protection mechanisms built in. This page identifies some of the components that customers sometimes blow, with some other key components. This is not an invitation to experiment! The board shown is a Mk 2, but layout of the older Mk1 is very similar. The key components are indicated on the diagram below by a red arrow with a number beside it. 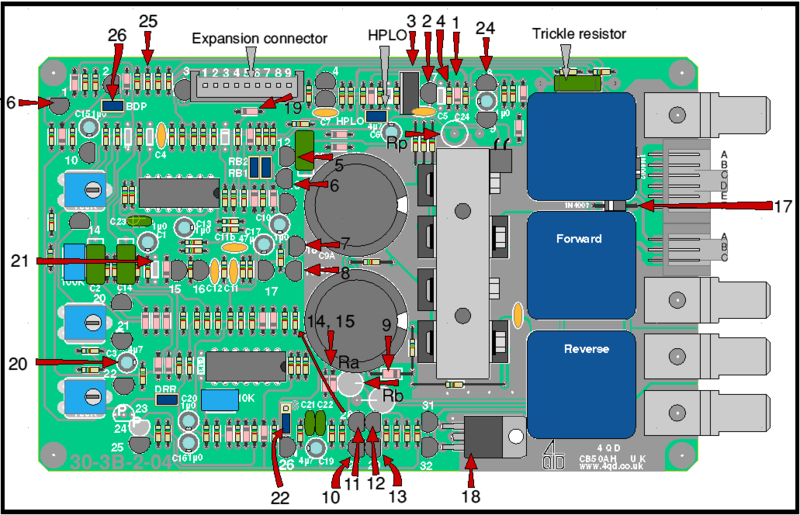 The transistors are separately numbered on the circuit board silk screen and are shown also in the drawing here (this can be useful if we need to discuss transistor numbers via email) and the numbers cross-refer to the circuit diagram, Tr1, Tr2 etc. The indicated components are as follow. The numbers are the same as those used on the NCC, so there are gaps. This is deliberately chosen so that it has a tendency to fail short-circuit under any overload conditions. By failing thus, it protects other components and is generally good at limiting the damage. Type BZX55V 8v2 or any similar zener of the right voltage. Beware that if the zener is damaged, Tr 8 (item 24) also may well be damaged. 2. Current source reference transistor. Tr 7. 3. Current source dropper transistor. Tr 6. Type is TIP42, as it can get quite hot. On the 48v version, this is on flying leads and is mounted on the base plate. See NCC and Pro-120 series power and protection mechanisms. 4. Current source 18R sensing resistor. If you have an accident which blows the current source, the 18R can turn black. Best replace it is if it’s discoloured. And it’s safest to replace both transistors. Can be blown if the MOSFETs go, if so, the 10R (CR16 size) gate resistors must be checked. We choose this size because they quickly fail open-circuit and rarely burn up. Check also the 9v1 gate clamp. Usually it’s the PNP driver that goes, the NPN one survives. 9. Gate clamp 9v1. If this is blown, the MOSFETs are certainly dead and the 10R gate clamp resistors (to its right on diagram) will need replacing. The relay drivers are not at all fragile, but they can get blown if an uninsulated motor connection contacts the circuit board. Also, reversing the battery tends to blow both PNP drivers and the catching diode! 14. Relay catching diode 1N4148. 15. Relay catching diode 1N4148. 17. Brake catching diode 1N4002 – hidden beneath the relay. 19. Overvoltage catching zener (47v on 12, 24 and 36v controllers). 20. The ramp capacitor. See Ramps – acceleration and deceleration. 21. Current limit resistor. 47K here gives a limit of around 55 amps. 22K gives zero current. The relationship between them is linear and is explained for the Pro-120 series. 22. Half speed reverse header. Link is shown in ‘half speed’ position. 23. Reverse-ignition diode. This is not present on the Pro-120 series. 24. Tr 8. BC 337. The power relay drive transistor. May fail if the 8v2 zener is damaged. 26. Undervoltage. With issue 7 and after, linking these two pins essentially removes Undervoltage cut-back. Not always desirable as if the supply voltage falls too low the relays will simply drop out and this is not safe.